In the Coastal Empire and Lowcountry, the beginning of the holiday season is often marked by the throwing of oyster roasts. They usually begin at Thanksgiving, but really pick up in December and continue into Spring. The weather cools off and the bugs are generally at a minimum, so it's safe to hang around outside and eat stuff. Roast of course is a misnomer, as we are generally talking about steamed oysters, but calling it an "oyster steam" sounds like a trip to the sauna that went bad. 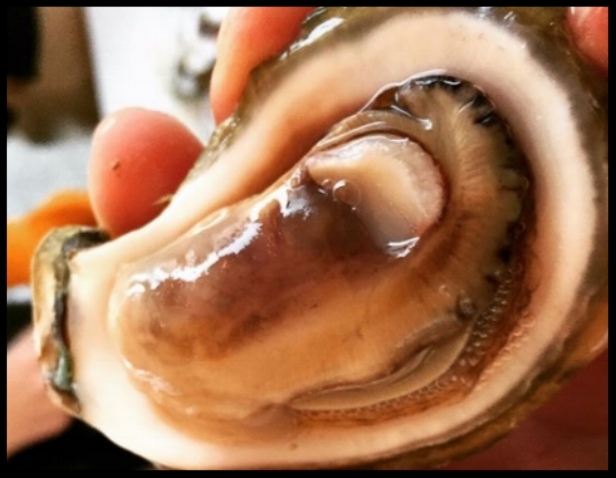 As we are winding down the winter (Spring has come and gone twice already in true Savannah fashion), it is time to give a report on the oyster goings on around the area. A few weekends ago I had the pleasure of attending an engagement party in Savannah where the guests were treated to a lowcountry boil (or Frogmore stew if you're weird and South Carolinian) and an oyster roast. We convened in the back of a grand old house a few blocks from Forsyth Park where tables had been lined with red-checkered clothes and adorned with the necessary accoutrements: oyster knives, gloves, paper towels, hot sauce, butter. I arrived just as the brother of the future bride, a fellow local named Michael, began to load the steamer with clusters of oysters that he himself had harvested the day before in town. 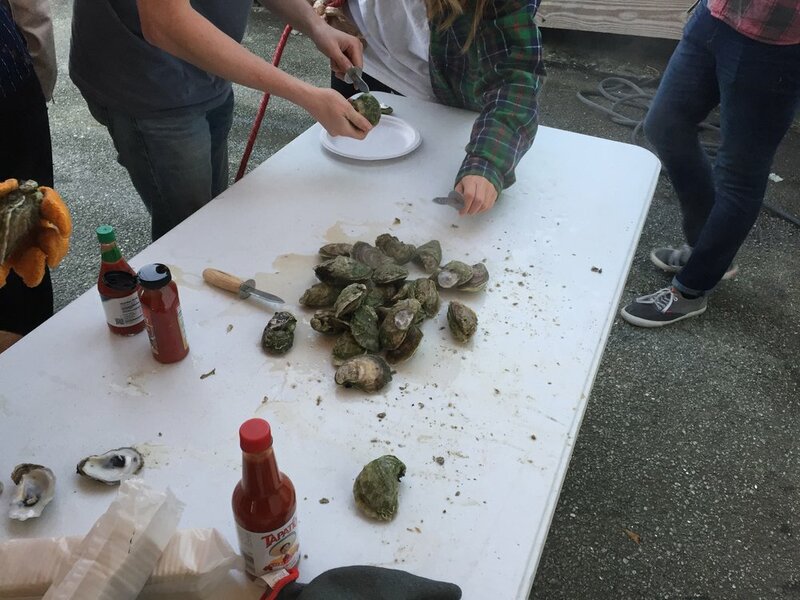 There is an area off Lazaretto Creek on the way to Tybee that the DNR has designated for recreational oystering, and Michael had gone out there with his friends on their boat and plucked about two bushels worth by hand (and pry bar). Once the first batch was ready, I helped him dump the oysters onto the table in a steamy heap. People, as inlanders often are, were shy to come up to the table so to get things going. Thus, Micheal and I shucked a couple and handed out the sweet, plump morsels on saltines to anyone interested. I got the perennial question as I worked, popping shells and slurping down mollusks, "What do I do with them?" I did my duty as the Coastal Emperor and enlightened as many folk as I could as to the basics, and soon a whole group had ringed the table and jumped in on the fun. 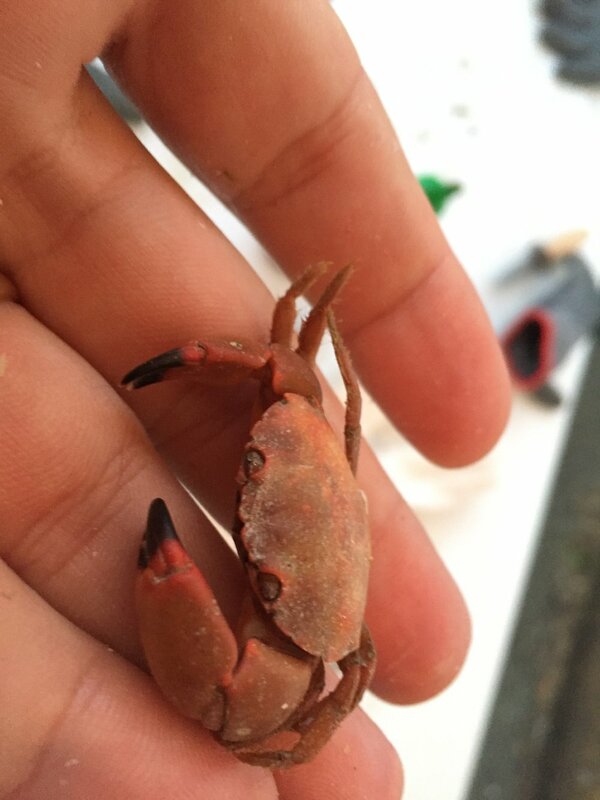 At a few points, I open up a nice big oyster to reveal a cooked pea crab. This sight got a few disgusted reactions; particularly when I popped them into my mouth and crunched away happily. That same weekend I also found myself heading up to Charleston to take part in a lecture and discussion on the future of Oyster Aquaculture. The lecture was being put on by Garden & Gun (the magazine) at their gorgeous offices in the Cigar Factory development just outside downtown. The event as a small part of the Southeastern Wildlife Exposition and was attended by lots of nicely dressed Charlestonians who spent about an hour drinking bourbon cocktails and eating cheese straws before the talk. The keynote speakers were the owner of Rappahannock Oyster Company out of Virginia and the young fellow who had started Seaborn Oysters in Charleston, on the backside of Sullivan's Island. As part of the talk they passed out neat little plates with three oysters on the half-shell to each guest and led a tasting. Two of the oysters were from Rappahannock (who have a restaurant in the same development as the G&G office) and one was from Seaborn. The local oyster tasted the best to me, with a lovely sweetness and just the right salinity. Left and Middle: Rappahannock's River, Olde salt. Right: Seaborn's Ol' Danger. 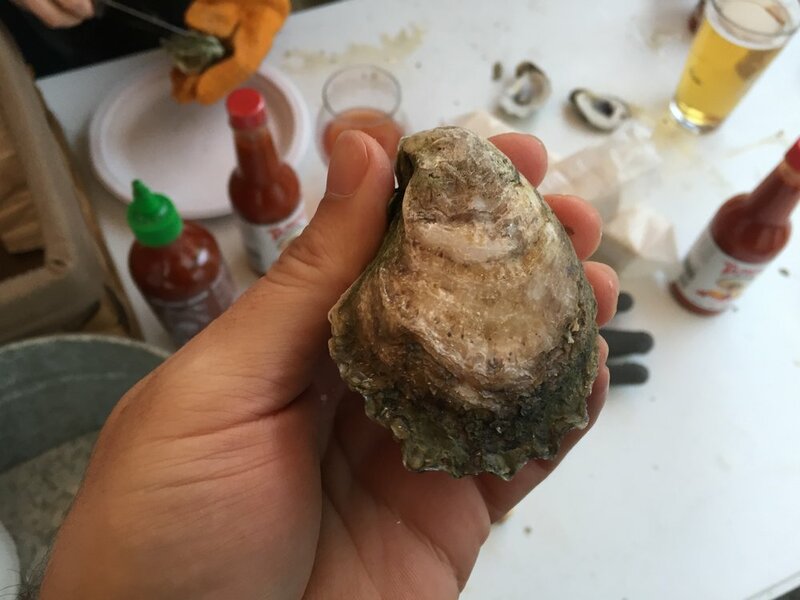 Part of what made the discussion interesting was the quite different way Seaborn was farming oysters in the Lowcountry as opposed to the method employed by Rappahannock up in the Chesapeake Bay area. Most farms use cages and grow the oysters from seed individually (as in not clustered)--at least for a period of their cycle. You get beautiful, clean singles that way. Seaborn farms their oysters just like they grow out here in the mud, on natural beds. They cultivate the beds and keep the oysters maintained by hand, with the idea being to grow food but also encourage the restoration of the natural ecosystem as the oyster beds themselves are the very foundations. I've had the opportunity to try quite a few different variety of local oysters, as they are becoming increasingly accessible. 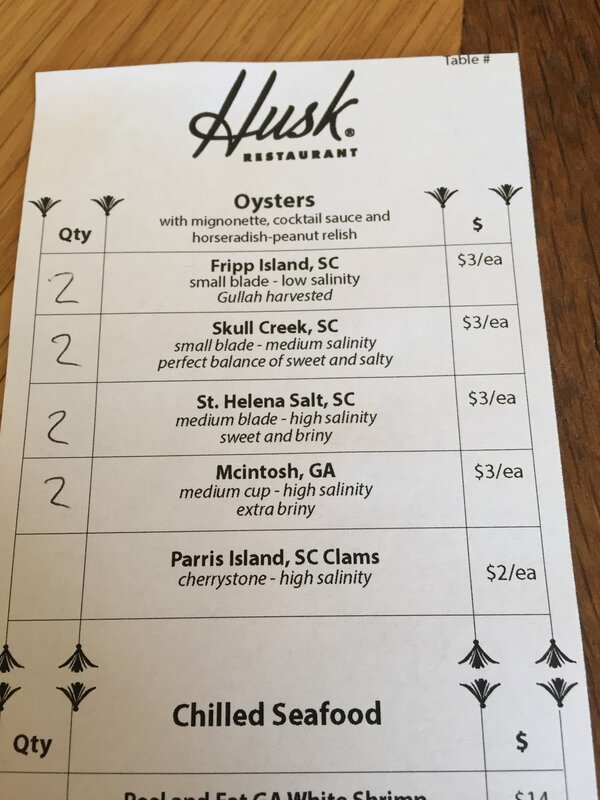 For a while now, The Grey has featured oysters raised south of Savannah in the Harris Neck Wildlife Preserve (they are appropriately known as "Harris Necks") and they still offer a happy hour deal with them--only now just on the weekends. Recently though, the big show has become Husk Savannah, which features a dedicated raw bar featuring multiple local options on any given day. They also make their own cocktail sauce and horseradish with green peanuts and other fancy stuff, not that you need any add-ons. Husk started brunch service in March and the wife and I went to get their burger (more on that later) and decided to grab some oysters to start. They had four local specimens to try, 3 from S.C. and one from McIntosh County (which is Darien). The Georgia oyster was considerably saltier than the rest, and we found that day the St Helena Salts to be the best. Going to a restaurant and buying oysters is fine, but the real treat is when local businesses try to lure you in with the promise of free oysters. The venerable Coach's Corner threw a free roast back in December to celebrate their "birthday", as did one of the local breweries. Things must have gone well with the brewery oyster roast, because a few weeks ago they had a repeat. Coastal Empire Brewery, which is located in an industrial pocket on the westside of town, is not a place you would just casually happen upon. Thus, using free oysters to entice people away from downtown probably makes good business sense. The wife and I keyed in on this oyster opportunity via social media and I reached out to the guys to ask where they got their shellfish from. They replied that they had a bunch of beautiful Apalachicolas that they were going to lightly steam and distribute--again, for free. I knew better than to pass up the best oysters in the Gulf, some might say the world, so we got to the brewery right as the first batch was coming out of the steam. The shells were beautiful, and as usual, most of the other customers there were too timid at first to belly up to the table and get to shucking. Eventually though our enthusiastic slurping proved contagious and the poor brewers were having to work double time to keep the oysters coming. We hung around long enough to get our fill and show some tourists how to shuck and slurp and then we took off, but not before I saw a whole unsteamed bushel still ready to go. Props to the guys at Coastal Empire Brewing for the good showing. Sadly though, things didn't work out for everybody as a poor little stone crab got caught up in hubbub and cooked alive. To honor his sacrifice, I did my best to get some meat out of his little claws, like the gentleman that I am.